Used to create a link from grid field to any existing project application. When you select link type field, a drop down list is displayed with all fields available (displayed) in the grid for selection. (See Select Fields). Image2: Link between application Interface. The image below displays all the project applications (menus, search, reports pdf, forms, grid, tabs and control forms). Select the form application called by the grid. Field - Used to pass a grid field value as parameter. Value - Used to pass a fixed value as parameter. Variable - Used to pass a global variable value, used by the grid as parameter. Empty - No value is passed as a parameter. The image below displays the attributes that define the link behavior. Enter the selected option to customize the link properties. Open in same window Display the form in the same browser window, (in another page, the form display substitute the grid). Open in another window Another window is open to display the form . The form is displayed in an frame, in the same page, below, above, right or left to the grid. Called application exit URL: Called form exit URL. Default address (back button) is the calling grid. Link hint - Message displayed when mouse is dragged over the linking field. Label - Sets the link title in the application. Used when there is more than one link in the same field. 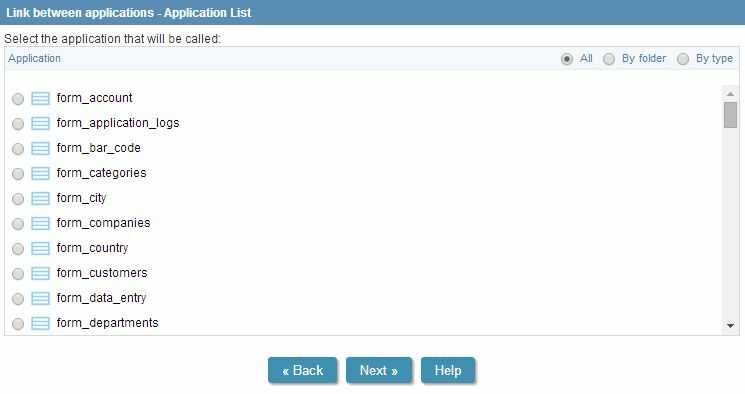 These options are displayed only when the called application is a form. Allows to select the buttons displayed in the form. Enable Insert button- Enables the buttons New and Insert in form. Enable Update button - Enables the Update button in form . Enable Delete button- Enables the delete button in form. Enable Navigation buttons - Enables the navigation buttons (First , Previous, Next, Last) in form. Iframe position relative to the main application - The form is displayed together with the grid application according to selected position. Options are: Below, Above, Right and Left. IframeWidth - Iframe Width in pixels. Save Button - End the link wizard.